You know those select streets in the city where the jet stream feels like it’s going to rip your face off and sweep you up into its gust all in one blast? If you’ve made it through a winter in Boston, you’ve experienced it. It happens to me every time I walk home and cut down Somerset Street in between the police department and the Government Center parking garage. And while I don’t particularly mind it right now while the temperatures are mild, it’s quite another beast in the dead of winter. This is kind of what a cryofacial feels like…but oddly, in a good way. You’ve probably heard of cryotherapy, or cold therapy, by now. You may even have made your way to a freezing cold chamber yourself to see if you can withstand the temps. The potential benefits of the treatment include reduced inflammation, improved circulation, and a boosted metabolic rate. Even Mark Wahlberg fits in a cryo session every day and touted his love for it on the Ellen Show. And he’s not the only local who’s a fan—fitness instructor and leggings queen Kelly Brabants loves cryo. But not in the traditional sense. 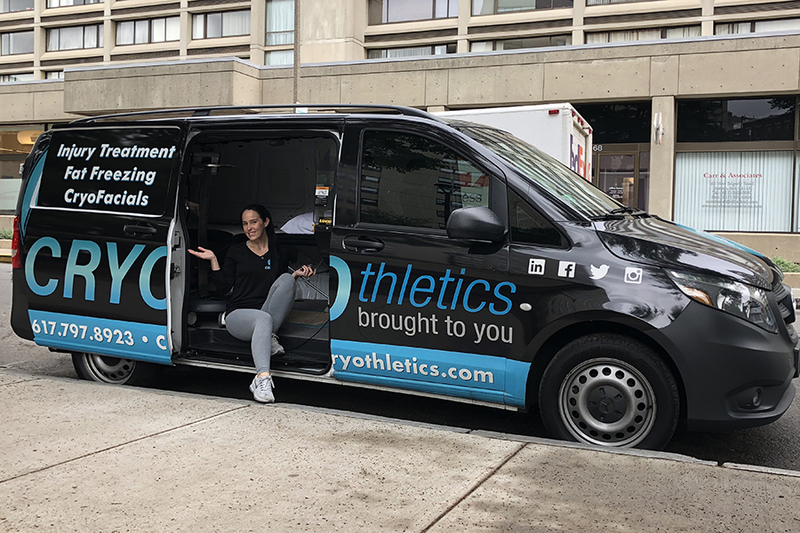 The traveling cryotherapy van for Cryothletics comes to you courtesy of sports therapist and trainer Dionne McGinn, who looked at the giant chamber required for cryotherapy and thought, how can I bring this to people’s front doors or offices? I was intrigued, and had to give it a try. The van is just a standard black minivan, sliding doors and all, and is decked out with tinted windows and Cryothletics branding. McGinn had me take a seat on a small folding therapy table pushed up against one wall with a white pillow placed at one end. A large tank sat on the floor of the van next to it with a long, snaking tube protruding from the top. I laid down on the table as she used the small tube attachment coming out of the tank to sweep -220 degree air on my face for the cryofacial. As it billowed over my face, McGinn talked about how the cold temps work to draw blood out of the face to reduce inflammation, puffiness, and improve a whole host of other skin issues, including wrinkles and acne. “The more you do it, the firmer your skin will be,” she says. Although the air was cold (read: colder than an Antarctica winter), it wasn’t uncomfortably so. McGinn occasionally had to pull tiny ice crystals from my hairline, as the air interacts with hair products, latches on, and creates condensation. She says the course of treatment depends on what condition your skin is in at the beginning, but that she recommends about 3-6 sessions a week for one or two weeks before dropping down to maintenance sessions after that. “We like to call it the glow up,” she says. Fine by me, since highlighting is all the rage right now. When she finished on my face, which took about 10 minutes in total, I sat up and could feel how tight my skin had gotten (just like when you walk through a whipping jet stream in the city!) and my ears rang with coldness (because of my earrings). But other than that, there was no significant change. Not even when I came back to the office did my co-workers notice a difference. Whomp, whomp. But if I thought the cold air felt good on my face, it felt even better on sore muscles. When we work out and create micro-tears in the muscles, the recovery process begins by piecing those fibers back together, McGinn explains. The cold air is simply drawing out the blood, decreasing inflammation, and speeding up that process. After she worked on my glutes, they felt instantly better, which lasted for about an hour after I left, but I can’t say that I felt much of a difference later in the day. I was also not in any type of significant pain—just regular muscle soreness. I don’t believe there is an end-all-be-all when we talk about wellness gimmicks, and neither does McGinn. She wants this to be a supplement to what you’re already doing, whether that be lifting, yoga, or cycling. It’s a mode of recovery that might work for you, or it might not. As for me, I’d do it again…or I might just reach for the frozen peas in my freezer.